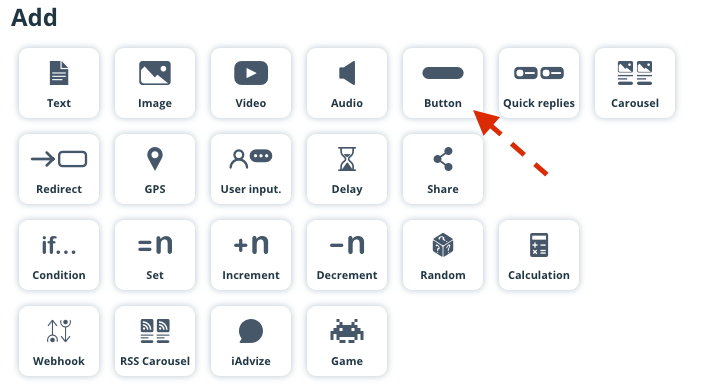 There are two different ways to create a button. The first way is to directly include this feature by clicking on the "button" element figuring among the rest of the features. 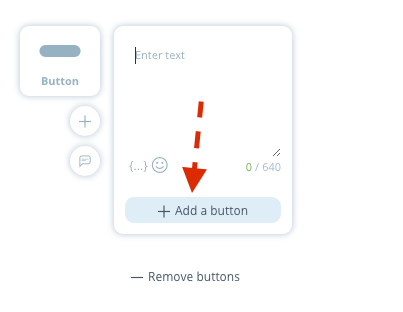 The second way is by creating a text, and then transforming this text into a button. 1. Begin this procedure by adding a button feature. 2. Once your text has been created, click on "add buttons". 3. Your text had been transformed into a button. You can add a maximum of 1 to 3 vertical buttons. A redirection : This button will redirect your users to another sequence. A website: Your chatbot will redirect your users to a website. A phone call: Your users will be able to call the button directly. 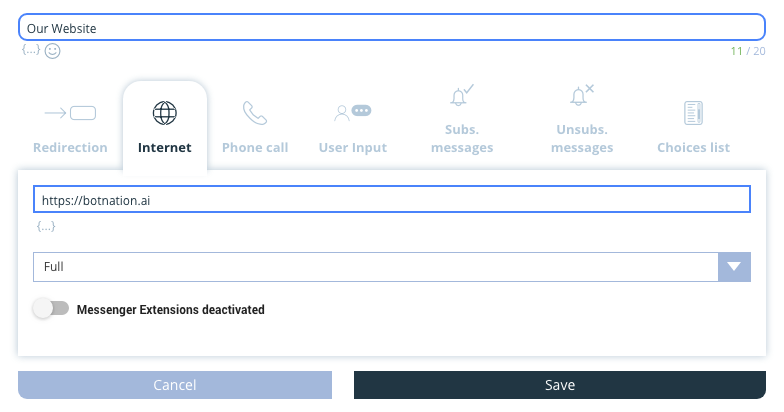 A user input: This feature allows your chatbot to record action information (like buttons, quick replies), free entry (mail, mailing address), etc. You can thus re-use this information in the conversation or export it (see the API function). Subscribe / Unsubscribe to notification: As the name suggests it, this action button allows you to subscribe or unsubscribe your users to your notifications. A list of choices: This feature allows you to create a list of choices. You will find that this feature gets handy for contests. In the following example, we want to redirect users to the BOTNATION.AI site. 5. Click on "Internet", and then include a title, a URL, and select the size of your webview. 6. Your button has been successfully created!